When you’re building your business, the ever overlooked business card is a piece of marketing material that I feel is very valuable. Today, people are focused on social media promotion and interacting with their clients over the internet, but what about when you come across a person in ‘real life’ who wants to know more about your business? Do you stop, write your website, name and email address down or do you just whip out your business card? I hope that you’re wanting to utilize a business card for your business. 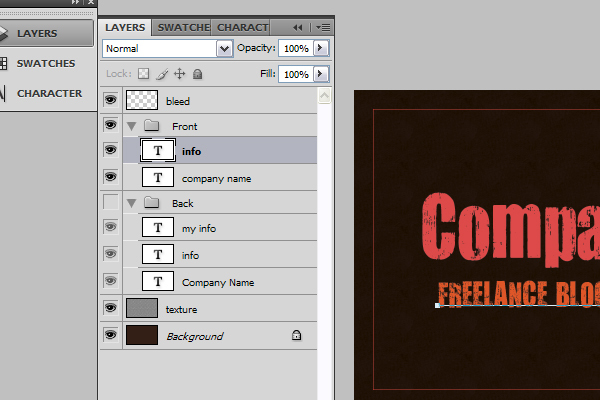 Today’s photoshop tutorial will take you through the step by step process on how to design your very own business card (front and back). I’ve also included a couple of extra options in the downloadable photoshop file so you can play with them, edit them and make them your own. Below you will see the spec’s were using for today’s tutorial. 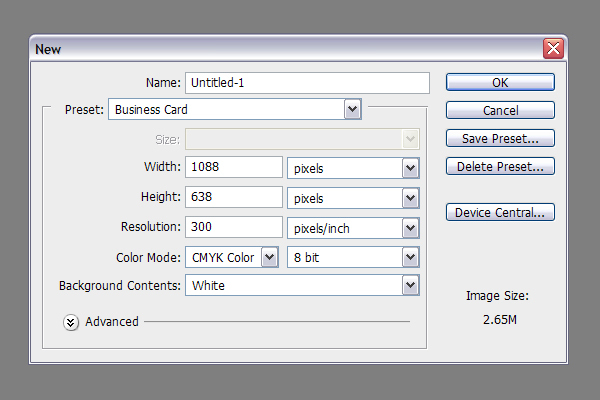 First, create a new document and plug these specs into your document and click ok.
For your business card, the background design you use will touch the edge of the document, but for the text, you’re going to need to keep it within a ‘safe zone’ in case things get cut different during the printing process. You don’t want to order 1,000+ business cards, only to see that half of your email address or phone number is cut off. 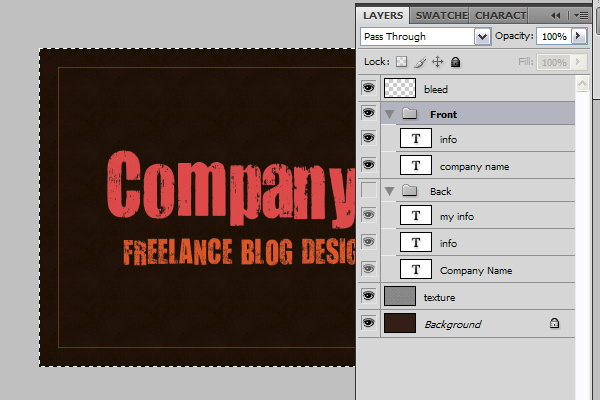 You’re going to create a new layer and name it “bleed”. We’re going to make a selection that is 38 pixels away from the edge, all the way around and add a 1px stroke in red. We’re going to have to keep our text and/or logos within this space so it doesn’t get cut off during the print process. Note: The official bleed space for different printers differs. Please ensure that the safe zone you’re setting up works with the printer that you’re going to use. First, we’re going to fill the background layer with a dark brown color (#311504). 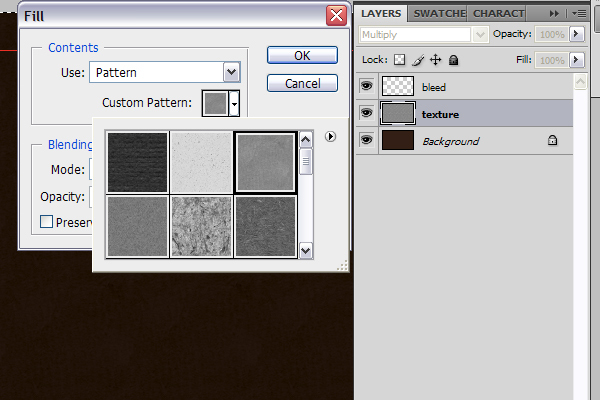 After you do this, create a new layer and name it “texture”. 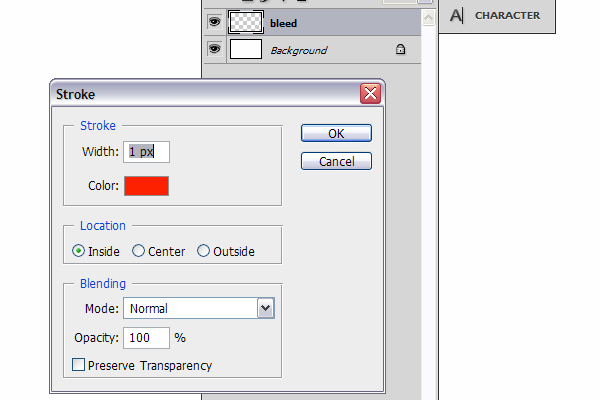 We’re going to fill this layer with a default texture that’s in adobe photoshop cs4 (seen in the image below) and changing the layer blending mode to multiply. 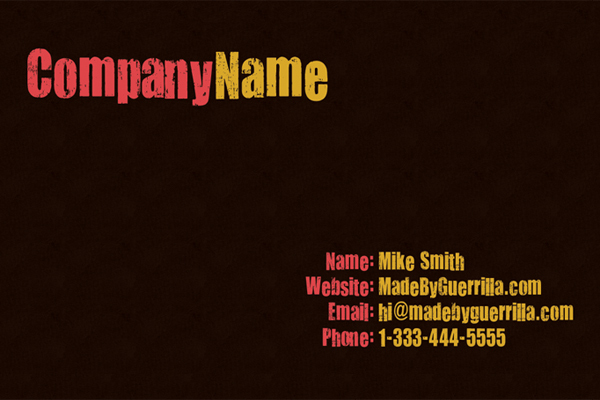 Now that we’ve got the background set up, we’re going to add the company name. 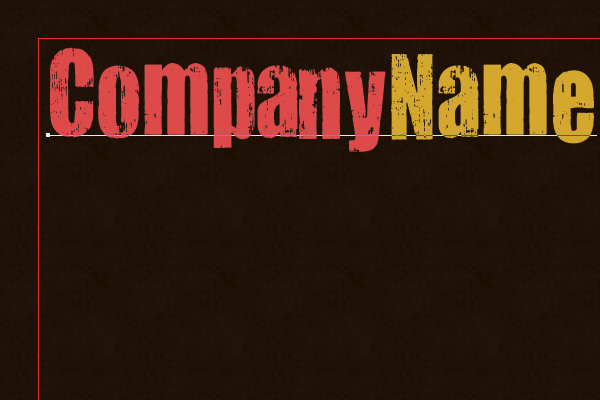 In this tutorial, we’re just going to use, you guessed it, Company Name, so make sure you add your business name in. For the font, we’re going to use the free font, You Are Loved from DaFont. We’re going to type in 24pt size and use two colors, one for each word of our company name. The first color is #de4549 and the second color is #d8a728. 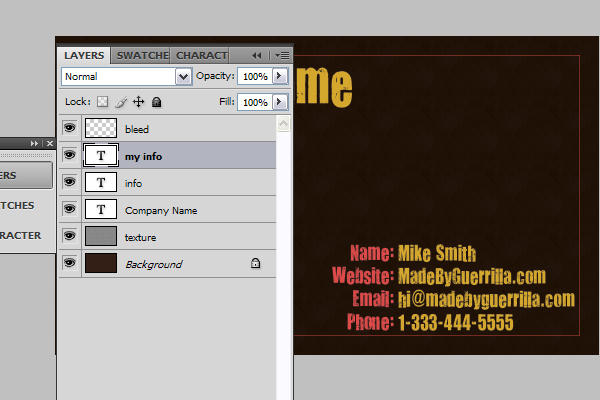 Now that we’ve got the company name added into the top left, we’re going to add some more text onto the document. 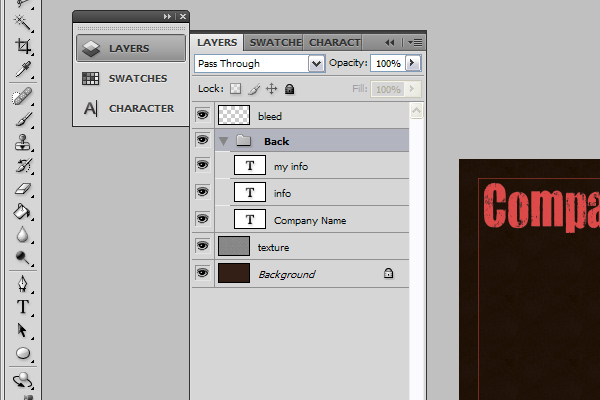 Create a new layer and name it ‘info’. 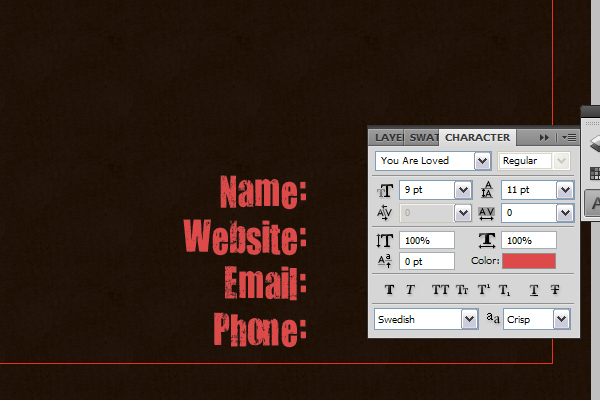 In this layer, use your type tool and type in the following information, using the character options seen below. The color we’re using is #de4549. Make sure your text is aligned to the right so the right side of the text gives a flush area for you to put your information against. Next, we’re going to make a new layer and name it ‘my info’. In this layer, we’re going to be putting in your personal information. The color for this font is # and we’re going to use the same character information as above, aligning the font to the left. Now that we’ve got the business card designed and set up, we’re going to create a new folder for our layers to sit within. We’ll be naming this folder “Back”. 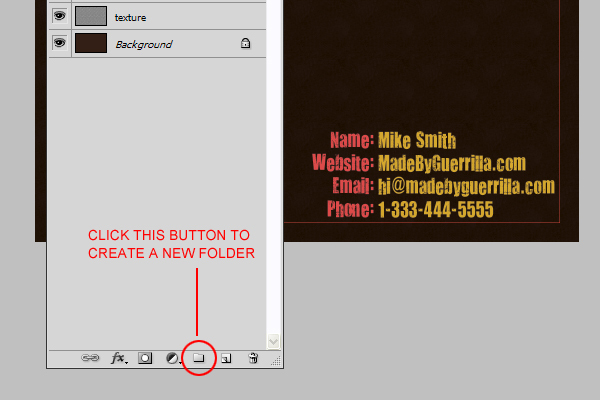 Start by clicking the new folder button in your layers palette. Now you’re going to place all of your text layers into this folder. It will look similar to below. Next, create another new folder and name it “Front”. 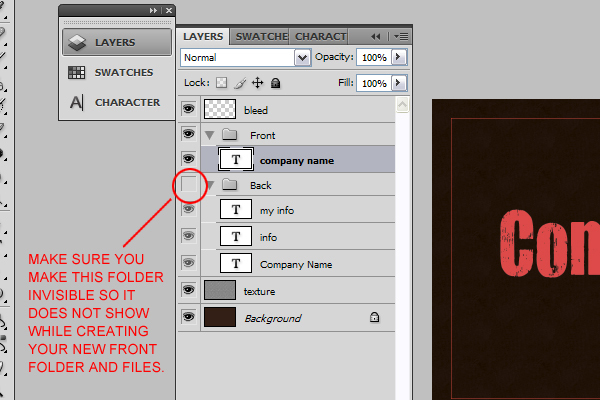 In this folder, you’re going to create a new layer and name it “company name”. 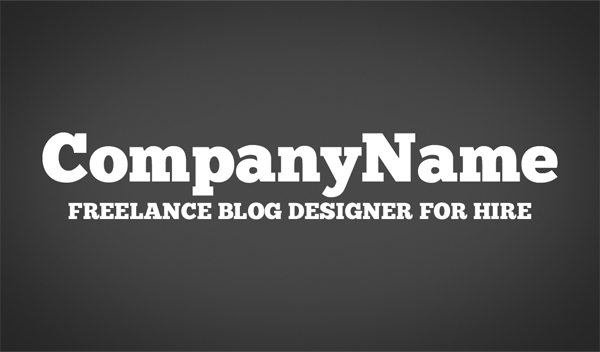 Grab your text tool and type “CompanyName” just like we did in step 4. This time, we’re going to make the font 36pt. 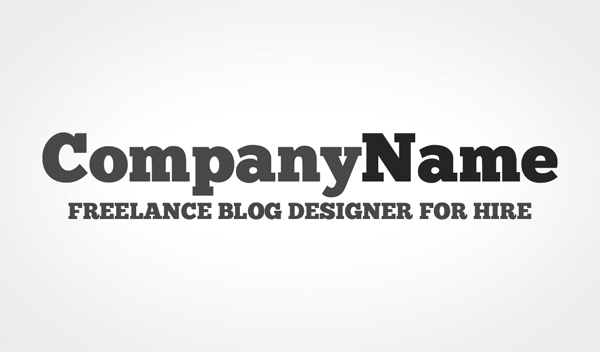 For the front, we’re going to want to keep things clean and mostly logo centered, so we’ll have your company name in a large font like this and we’re also going to add in a quick line of text to explain what you do. For this, you’re going to want to create a new layer and name it “info”. We’ll be using the same font we’ve been using, but making it 14pt and #e14f09. Now, you’re going to select the “Front” folder and then hit SELECT > ALL. Now, you’re going to head to LAYER > ALIGN LAYERS TO SELECTION > VERTICAL CENTER. This is going to ensure that your text is centered properly from top to bottom. At this point, you’re ready to save your work. Check with your printer to know what file type they’re after (TIFF, JPG, PSD, AI and so on). You’re also going to want to ensure that the bleed layer is invisible so you don’t have a bright red border around your business card. We offer web design testking HP0-A03 tutorials and website designing testking HP0-J26 demos to help you learn web site design and web development. Become expert in design work with our testking HP0-D06 course. This entry was posted on Monday, March 8th, 2010 at 11:20 and is filed under Tutorials. You can follow any responses to this entry through the RSS 2.0 feed. You can leave a response, or trackback from your own site. 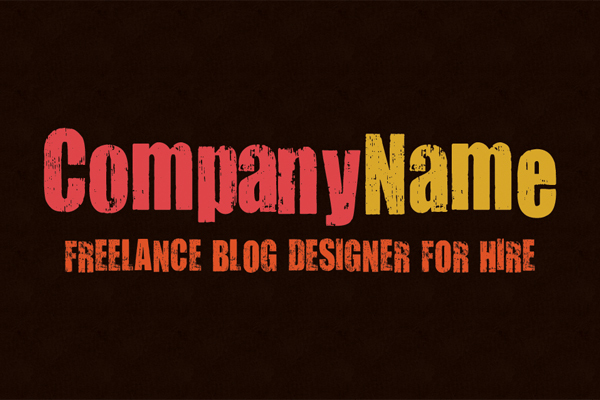 Mike Smith is a full time blog designer who recently started his own WordPress theme site, Giant Themes. He is a regular writer around the web design community. You can follow Mike on Twitter or visit his web site. Many thanks for your interesting Post.